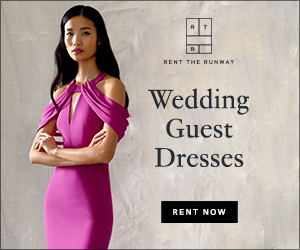 Honey Bee Weddings: Introducing Shelly! Shelly joined Honey Bee Weddings! 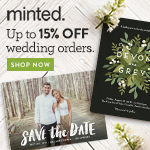 With a background in event planning for the young adult and tween market, Shelly coordinated her frist wedding in the early Spring. What better way to get to know a wedding coordinator than by seeing her wedding? 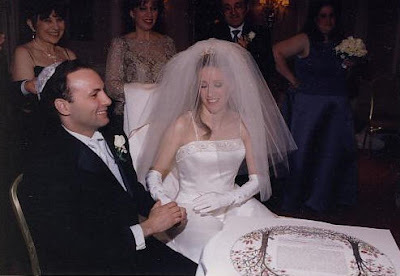 Shelly was married April 6, 2003. Over the course of her wedding weekend, it snowed, rained, iced, and was sunny. She lost 10 guests because of the weather. Regardless of what was going on outside, her ceremony and reception in the Gold Coast Room at the Drake Hotel was lovely! Below are some photos with her own captions. 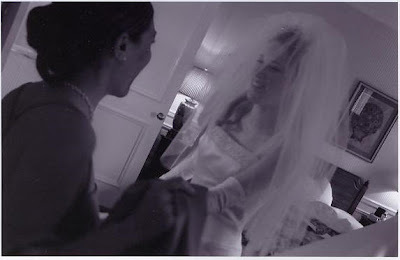 In my "getting ready room" holding hands with my oldest camp friend, Katy, who was also a bridesmaid. Getting ready and having some fun with my bridesmaids in my "getting ready room" at The Drake. Ron and I are signing our ketubah in a private room at The Drake surrounded by our bridal party. 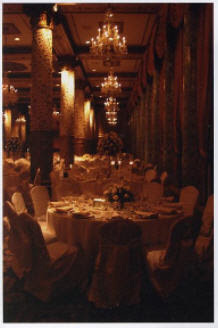 The guests were seated during this time in the ceremony room. 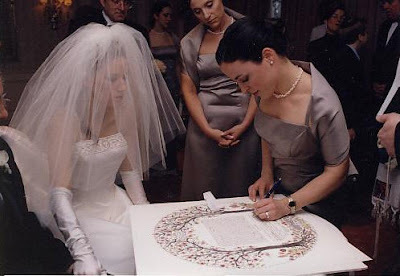 My two ketubah witnesses, closest friends and bridesmaids, Holly and Shannon signing our ketubah. 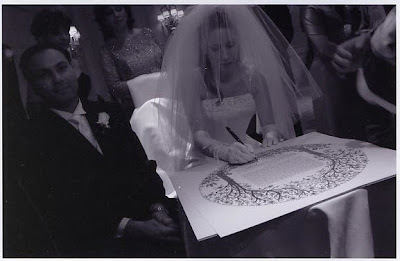 Ron and I are officially married according to Jewish law after signing our ketubah. We are shaking hands as a married couple for the first time! The bedeken ceremony, my mother and Ron veiling me. 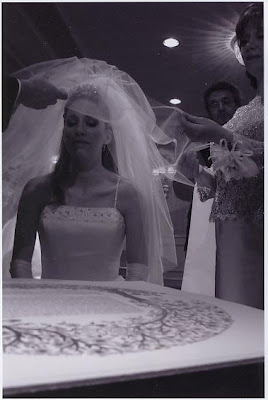 The bedeken ceremony is a Jewish wedding custom that takes place prior to the chupah; when the husband-to-be lifts up the veil of the bride-to-be to make sure it is the woman he intends to marry. 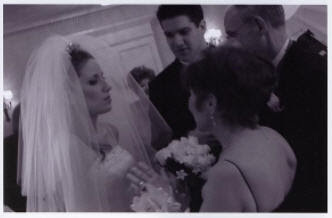 Me taking breathing lessons from my future in-laws and brother right before I am to walk down the aisle! Ron and I getting married under the chuppah by our officiant Rabbi Michael Siegel from Anshe Emet Synogogue. We're surrounded by our immediate family members. 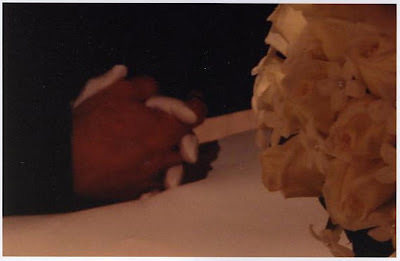 Ron and I are holding hands during our ceremony. Ron and I are holding hands under the chupah. I am wearing my grandmother's ring to get married. This ring is a gold circle with no stones which symbolizes eternal love. 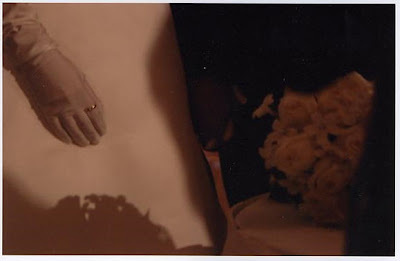 It is a tradition in my family for the female to use my grandmother's ring to marry. 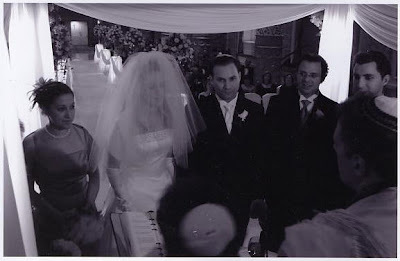 I had low and high centerpieces, satin striped ivory tablecloths and ivory chair covers. I was going for a soft feminine white wedding mixed with a hint of old Europe. 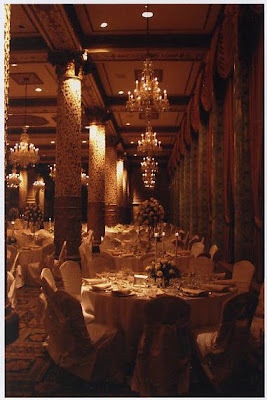 The Gold Coast Room offered it's stunning golden grape leave pillars and gorgeous chandeliers! A picture of my head table and the cake that was made in-house. 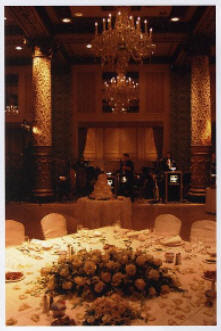 Another picture of my beautiful reception room in color with the chandeliers on low. My flowers consisted of ivory and peach roses, eucalyptus and Queen Anne's lace. The florist was Blooming City. 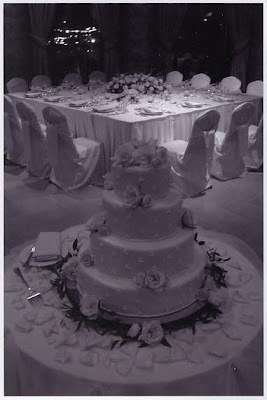 A picture of my wedding cake and the head table. The10 person band, Don Cagen Band, is playing in the background. 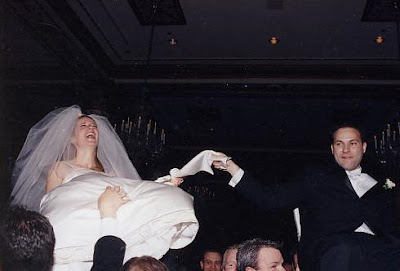 Ron and I are lifted up on chairs celebrating our marriage during a fast paced hora.